Silver too has continued its upwards momentum in the past 2 weeks, breaking above the major resistance in the $18.50 per ounce region as the industrial commodity continues to surge higher with $19 per ounce once again on the immediate horizon. The recent break above $18.40 was particularly significant as it now opens the way for a run towards $19.30 per ounce in due course, and this area should now provide an excellent platform for a continuation of the present bullish trend. 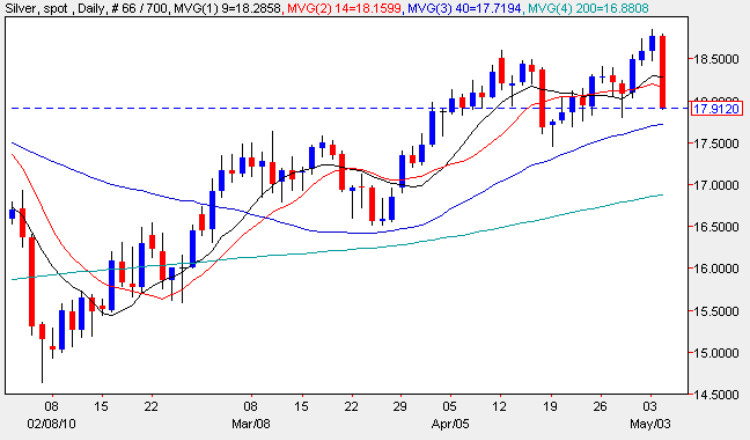 The technical indicators too, are suggesting a longer term extension and, in particular, the 40 day moving average has provided an excellent barrier to any short term reversal with the 9 day moving average also adding some excellent short term support. Longer term the outlook remains positive and provided we see a break and hold above $19.25 per ounce then we could see an attack towards $21 per ounce and beyond in the medium to longer term.